Here at Random Encounters, we spend a lot of time talking about big JRPGs—the Final Fantasys, the Dragon Quests, the Taleses. NOT TODAY. Today we're going to talk about the smaller ones. "But wait a minute!" you are almost certainly screaming right now, your hands shaking as you get ready to write an angry comment. "How often do indie Japanese games even make it to America?" Not very often! Fortunately, there are a ton of indie game developers in the United States who grew up on JRPGs, and many of them design games that emulate and add interesting twists to the classics we love. I do my best to play or keep an eye on as many as possible, and I want to share some of the most interesting ones with you today. And, yes, these are not Japanese RPGs. They are Japanese-style RPGs. But we'll call them JRPGs anyway, because we're okay with having flexible terminology because we are not insane. Here are eleven indie JRPGs I've been keeping an eye on. Combat is something of a mess in Alcarys Complex, an indie RPG released late last year by a company called Modest Arcade. I spent an hour or two with an early build this week, and it took me roughly 40 hours to kill a rabbit. But the writing is fantastic, and the ideas are really interesting: your characters progress not by killing things, but by talking to people. Conversations! There's a demo on their website if you want to check it out for yourself. In true Japanese tradition, the fourth episode of Penny Arcade's RPG series lets you capture and collect monsters, Pokémon style. I got to check out the upcoming RPG last month at PAX East, and it's looking more and more gorgeous every time I see it. This is one to keep an eye on. Zelda clones are very common. Good Zelda clones are not. Great Zelda clones that make you feel like you're exploring someone else's twisted nightmare? Very rare. And very cool. Book One of Dragon Fantasy, an 8-bit RPG that's designed to emulate the classics you probably grew up with, will be out on Vita and PS3 next week. Book Two, the 16-bit sequel, will be out this summer. The first book is full of good old-fashioned turn-based dungeon-crawling, and the second looks a whole lot like Chrono Trigger, complete with its own version of Mode 7. Mode 7! I first wrote about Tempus Chronicle last year, when the folks behind it tried to raise $200,000 for the episodic role-playing game series they describe as a cross between Lost and Final Fantasy. No dice. But the game's still happening, although there's no word on a release date just yet. We're keeping an eye out! Blending Phantasy Star IV's aesthetics and a goofy sense of humor, Sully: A Very Serious RPG! has been on my radar since I walked by the booth at PAX East last month. It looks pretty neat, even if the trailer does misspell "plebeian." I've been playing this bizarre little RPG on my phone for a while now, and it's really quite interesting. Part visual novel, part turn-based RPG in which combat is sort of a metaphor for computer hacking, Nameless: The Hackers has been quite the nice little distraction for my commute every day. If you're going to take heavy inspiration from a video game, there are worse choices than Mother 3, as the people behind Boot Hill Heroes know. No word on a release date for this neat-looking Western RPG, but I checked out a demo level at PAX East this year and came away pretty psyched to see what the final product is like. 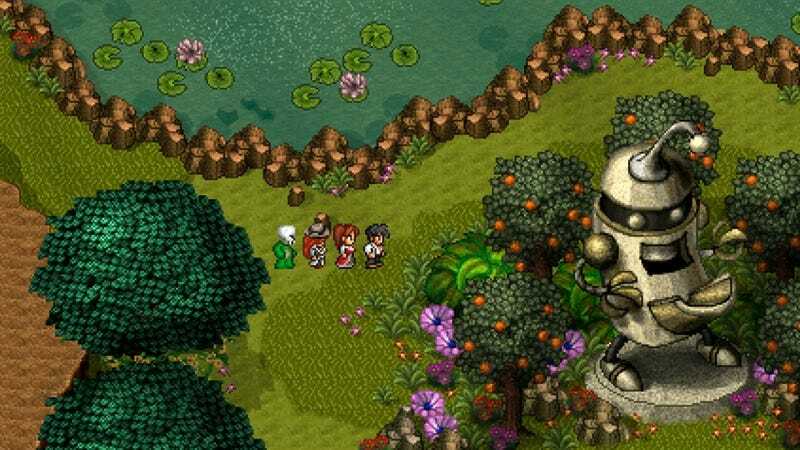 After successfully raising enough money to bring a remastered version of their Genesis—yes, Genesis!—RPG to other platforms, the folks behind Pier Solar now have quite the task ahead of them. The buzz has been great from people who actually bought the Genesis cartridge version of this game, so I'm pretty pumped to finally get to play it. Kickstartered last year, Echoes of Eternia looks straight out of 1998. For some people that might be an insult. For JRPG fans? It's the highest compliment. I have a weakness for comedy RPGs. Citizens of Earth—a strange-looking game in which you play as a caricature of a politician—seems like it will hit that weakness hard, Earthbound style.